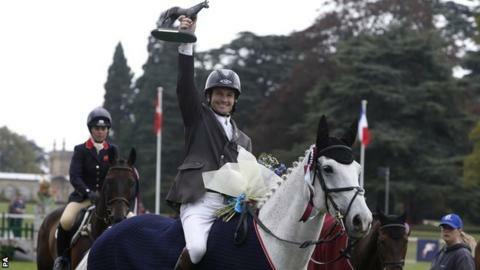 Francis Whittington edged out world number one William Fox-Pitt to win the Blenheim Horse Trials. Whittington put the pressure on Fox-Pitt with a superb clear round aboard Easy Target in Sunday's showjumping. Dorset's Fox-Pitt, riding Freddie Mac, was last to go but brought one fence down to finish 3.2 penalties behind Sussex-based Whittington. "To jump over that last fence was a relief - this is the best result I have ever had," Whittington, 37, said. "I haven't felt nervous before with him, but when I went into the arena I was anxious to do the best I could for all the hard work that everyone has put into us and the support they have given us. "We have a fantastic foundation to build on, my riding really improved over the winter, and it is realistic to think we can build on this if we work hard enough and aim for our goal, which is Rio [the 2016 Olympics]." Britain took the first six places, with Whittington and Fox-Pitt ahead of Jodie Amos on Wise Crack and Pippa Funnell on Second Supreme, while Whittington was also fifth with Fernhill Highlight, and Kitty King took sixth on Persimmon. Fox-Pitt, who won Blenheim's three-star event in 2000, 2010, 2012 and 2013, may now target one of 2015's four-star competitions - the highest level of eventing - with Freddie Mac. "It is always frustrating to have a fence down when you can't afford one," the 45-year-old said. "But he has shown what a good horse he is and I think we can look forward to a four-star with him next spring. He is a horse with a big future and I am very excited about him." Wiltshire-based New Zealander Jonelle Price won the three-star class for eight and nine-year-old horses aboard Faerie Dianimo.